Treasure Hunt is the name that Myles Byrne-Dunhill gives to his ongoing musical project. This is his second album after the excellent Meems of last year. 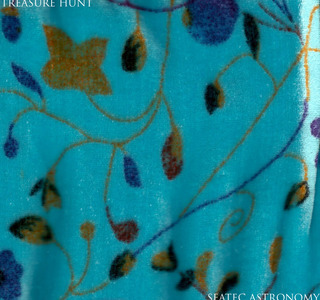 Myles calls Treasure Hunt a pop collage project but I think that what he actually achieves on Seatec Astronomy is a the next line in avant garde pop music of a lineage which includes bands like Vibracathedral Orchestra and Sunroof. Myles is one of the new breed of artists who embrace the pop cultural references of their youth without irony. It’s OK to like pop music now and that idea is refreshing and has been the theme behind many of the great records released on Not Not Fun for instance. In making that reference though, it is important to point out just how experimental Treasure Hunt is . There are some similarities with the Danse Manatee sound of Animal Collective but it is the layers of field recordings, tribal drumming, blissed out drone, marimba’s it’s like the Avalanches for the Hypnogogic pop set. I can’t recommend this highly enough. If you like your pop music difficult this may be the record for you. All of Myles records can be downloaded off his bandcamp site.